The Democratic Republic of the Congo (DRC) is a country of tragedy and promise on a massive scale. Nearly one-quarter the size of the United States, the DRC is home to important tropical forests, vast hydroelectric potential, and resources ranging from diamonds to zinc. It is also home to an ongoing humanitarian disaster. A war that began in 1998 caused widespread death and displacement. Though it officially ended in 2002, violence has continued, particularly in the east. The International Rescue Committee estimates that more than five million Congolese have died since 1998—including more than 500,000 per year since the official end of the war. Despite some positive developments, such as democratic elections in 2006 and an increase in foreign investment, the country continues to face severe security and development problems. In this Council Special Report, Anthony W. Gambino analyzes these problems and proposes steps the United States can take to help. He details the country's social, economic, and security challenges, ranging from lawlessness and corruption to poverty and poor health. He then recommends two priorities for U.S. policy: combating insecurity in the east and promoting sustainable development. 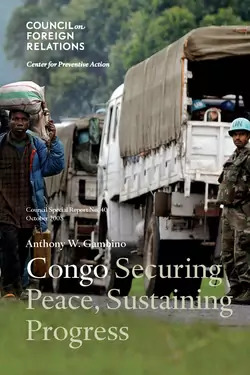 To bolster security, the report urges the United States to ensure that the UN peacekeeping mission in the DRC has an appropriate mandate and sufficient personnel and resources to remain in place for the foreseeable future, at least through the planned 2011 elections. On development, the report makes a number of recommendations, including increased U.S. assistance for the elections, environmental protection, and health. Congo: Securing Peace, Sustaining Progress lays out a thoughtful agenda for U.S. policy toward the DRC. Its call for more resources may meet resistance in today's economic climate. But the report argues that what happens in the DRC should matter to the United States—for humanitarian reasons as well as economic and strategic ones. The result is a sobering analysis that recognizes the scale of the challenge in the DRC but also outlines ways in which the United States can help the country toward a more promising future.